The rise of online streaming services such as Netflix and HBO Go has dramatically altered the media habits of Americans, especially young adults. About six-in-ten of those ages 18 to 29 (61%) say the primary way they watch television now is with streaming services on the internet, compared with 31% who say they mostly watch via a cable or satellite subscription and 5% who mainly watch with a digital antenna, according to a Pew Research Center survey conducted in August. 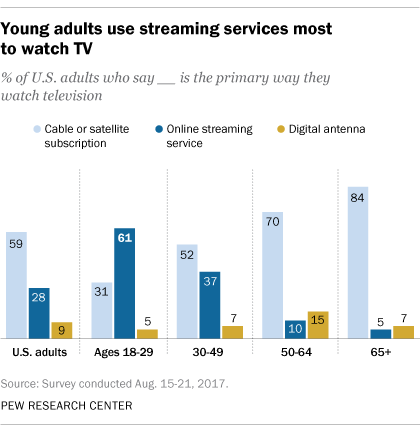 Other age groups are less likely to use internet streaming services and are much more likely to cite cable TV as the primary way they watch television. Women are more likely than men to say their primary way of watching TV is via cable subscription (63% vs. 55%). Men are more likely than women to say their primary pathway is online streaming (31% vs. 25%). Those with a college education or more are more likely than those with less education to say their primary way to watch TV is online streaming. Roughly a third of college-educated Americans (35%) say they mainly watch via streaming, compared with 22% of those who have a high school diploma or less. Those in households earning less than $30,000 are more likely than others to say they rely on a digital antenna for TV viewing. Some 14% say this, compared with just 5% who live in households earning $75,000 or more. The survey marks the latest in a number of Pew Research Center findings that show how much the internet and apps have shifted people’s access pathways to media and some types of content in recent years. The internet, for example, is now closing in on television as a source of news in the U.S. A generation ago, television was far and away the dominant news source for Americans, but now, the internet substantially outpaces TV as a regular news source for adults younger than 50. Additionally, 37% of the younger adults who prefer watching the news over reading it cite the web, not television, as their platform of choice. Social media is also a rising source of news: Two-thirds of adults – including 78% of those under 50 – get at least some news from social media sites. Not only are people’s pathways to information and entertainment changing, Americans are also interacting with media in new ways, thanks to always-on mobile connectivity. For instance, 85% of adults ever get news on mobile devices and more than half set up their devices to send them real-time alerts about breaking news and other activities, such as new social media posts by their friends. Additionally, even by 2012 notable numbers were watching two screens as events or shows unfolded – that is, they were watching TV and simultaneously had a mobile device at their side to keep themselves occupied during commercial breaks or participate in social media chatter about the event. Of course, there are major economic and corporate implications in these shifts. A 2015 Pew Research Center survey found that 24% of Americans did not subscribe at all to cable TV, and 15% were “cord cutters” who at one point had cable, but then opted for an internet connection as their pathway to video content. Note: See full methodology and topline results here (PDF).